9 Canada Goose Alternatives To Fit Every Budget — AS RAKESTRAW - The personal site of Alex Rakestraw. AS RAKESTRAW | The personal site of Alex Rakestraw. Ah, Canada Goose: for some reason unknowable, Expedition-style down parkas have become trendy. Due to either heritage or clever marketing, one brand has come to dominate this new space. Whether Antarctic parkas can be luxury apparel is up to interpretation, but it's hard to deny the facts. In 2016, Canada Goose is ubiquitious. The slick silhouette, matte finish, and red logo patch associated with the Toronto-based company have become synonymous with "expensive winter coat". Worn by the likes of Nicholas Cage and Daniel Craig, Canada Goose is pure utility. But when (barely) worn by Kate Upton, Canada Goose becomes a fashion statement that's sure to turn heads. For those who love the rugged look of a 'Goose jacket but don't want to spend $800+ dollars on a one-season piece, you're in luck: here are 9 parka alternatives that are sure to fit your budget, whatever it is. It wouldn't be internet menswear without at least one Uniqlo mention. The Japanese apparel company's Wool Blend Down Jacket is the definition of "LifeWear": elegant face fabric, high-loft down insulation, DWR-coated for elements, and at an affordable price point, to boot. The low price does mean no fur-lined hood, but that's a small complaint for arguably the highest utility:dollar point on this list. Available here in black or navy. A certified Expedition-style down parka with all the bells and whistles for literally 1/4 the price of a Canada Goose Langford. The North Face McMurdo is my pick for "best of the cheapest", but all the price savings did come with some drawbacks. Namely, I'm talking about its weight. For a jacket stuffed with "lightweight 550-fill down insulation", the McMurdo is HEAVY. The coat weighs close to 5lbs. Imagine carrying an extra textbook with you to class, and then imagine that textbook restricting your arm/shoulder mobility. All in all, the McMurdo is a certified beast that also looks the part. $$ - Purchases You Rationalize With the Word "Investment"
The classic utility down parka by Penfield follows a familiar formula: down-blend insulation, DWR-coated face fabric, faux fur hood. This message will repeat. Why spend the money over a McMurdo, then? Because the Hoosac just looks better. Compared to The North Face parka above, the Hoosac has much cleaner lines (no chunky velcro closure, no bloated chest pockets) and better emulates a classic survival jacket. Likely because Penfield predates the modern, hyper-technical outdoors industry. That doesn't mean the Hoosac won't keep out cold - it's as warm and weather-resistant as any others. I just want to give special mention to Penfield because they're one of the only aesthetically-oriented outdoors brands operating at this middle price point. Also, there's no obnoxious branding - again, the Hoosac just looks better. You can get your Hoosac on Penfield's website here. There's a grand irony to calling a Triple F.A.T. Goose jacket an imitator. Only two decades ago, Triple F.A.T's jackets ( designed for "For Arctic Temperatures") were to New York what Canada Goose is today. Ask your parents or cool older cousin: this brand's puffer jackets were standard issue for the background of every 90's rap video. Between now and Biggie Smalls, the brand hit some financial troubles and was swept under the rising tide of Columbia/The North Face circa late 90's. In 2016, and under new management, Triple F.A.T. Goose is looking to regain its prestige in a packed outerwear market by offering literally the same looks as a Canada Goose Langford Parka for around half the price. For $50 more than the Hoosac, you get the Goose aesthetics, coyote fur, and a shoulder patch. The Chenega is every inch a capable piece, but it's just a little too close to the real deal for my taste. If you want the Canada Goose look at a lower price, however, you can get your Triple F.A.T parka here. And now, my personal piece de resistance: the Fjallraven Yupik Parka! Here are the key differentiating factors: taped seams, hydratic membrane-backed face fabric, synthetic insulation instead of down, removable hood. So why should you choose the Yupik Parka over its down-insulated cousins? Because it's the warmest coat in this price range. In the same way that the McMurdo is stuffed with down, the Yupik is absolutely gorged with Supreme Microloft. Technically, synthetic insulation is less warm by weight, but it won't make much of a difference. I see the Yupik as the best features of the lower ranges combined: the looks of the Hoosac, the warmth of the McMurdo, and the weather resistance of the Columbia. Yes, you don't get a big red shoulder patch; instead, you get a $600 jacket for a third the price. Get your Yupik parka on sale at BackCountry.com here. Canada Goose products aren't bad. They're actually quite good. For Arctic-rated parkas, in fact, they're hard to beat. I even get Canada Goose coats as an aesthetic piece - they've got elegant lines, celebrities like them, and the company has an excellent marketing team. Especially considering Bain Capital invested $250m in 2013 to help grow the brand. Yes, Mitt Romney Bain. The people who own Domino's. That's why I'm not particularly opposed to Canada Goose: it's a good product and personally, I champion people buying what they like. I'm more frustrated that most Geese are afraid to own that they paid close to $1000 (delta $500 over mid-range) for the coat because they like it. Perhaps it's because the price is common knowledge, and you don't want to come off snobby in mixed company. But unless you're routinely exposed to temperatures below -10F, you overpaid for overkill because it helped rationalize your fashion purchase. Yes, you're warm on your walk to class - but are you $400 more than the Yupik warm? In an extreme, once-in-a-generation snow storm, the answer to that question is an objective "yes." For light flurries, though, it's a little more hazy. That's the weirdness of modern mass luxury in a nutshell: you bought a winter coat to stay warm, but you paid through the roof for a Weblen good because it made you feel warm and fuzzy. It's borderline tautology. After all, Canada Goose is crazy expensive, right? No one could compete with their warm coats because they're the best. They're the most expensive because they're the best... right? French-Italian outerwear stalwarts Moncler invented the "luxury down parka" category, and they're not bashful about proving it. The Cluny down parka is the brand's longest silhouette for men outside of their Gamme Bleu/Moncler V designer collections, and features a real fur hood. The rest of the standard issue features (coated face fabric, down fill, shoulder logo patch) are here, but come packaged in a decidedly more athletic silhouette. If you ever go heliskiing in the French Alps, this is the jacket you'll wear in the lodge to tell stories after. 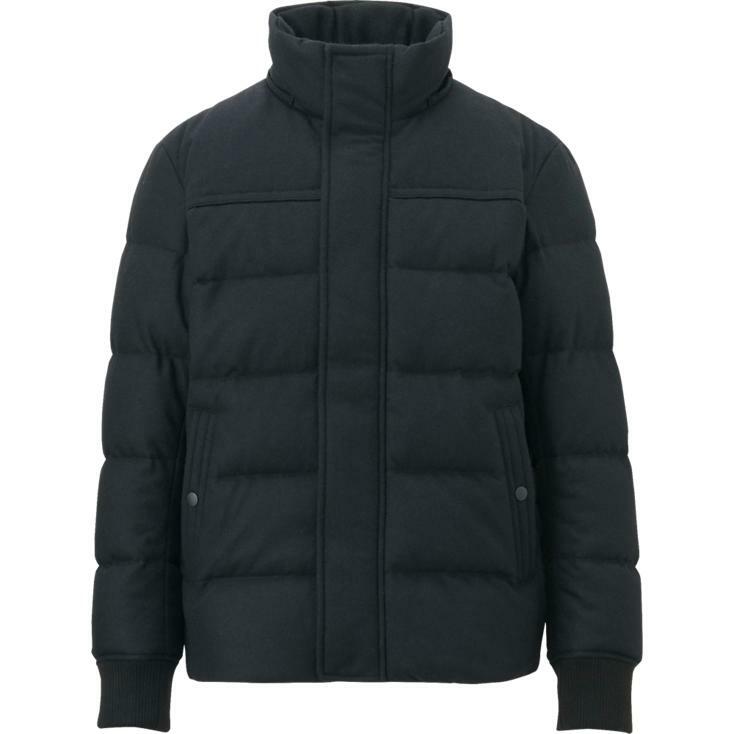 You can scoop the Moncler Cluny in Navy at an end-of-season discount now on END Clothing. Italian company Ten C goes to ridiculous lengths to create authentic pieces in heritage materials following original construction processes. As a result, their lined parka combination costs $3000. But hey, at there's free shipping. Get yours at Haven here. Nigel Cabourn is an English designer famous for his creative take on mid-20th century garments. You can buy 4 Canada Goose parkas for the retail price of an Everest Parka. Or, you could buy 3 Canada Goose parkas for the sale price of an Everest Parka. Following our logic above, this jacket is 4 times warmer and better than a Goose. That's uh... about it. I'm just a little excited something like the Everest Parka exists. Pick up your #grail museum piece at END Clothing now. Did this guide help you find the right jacket? Was there anything I missed? Comment below or on Facebook here to start the conversation.